T Ration App is launched in Telangana on 8th September by the Civil Supplies Department. This app was android based and designed with the help of NIC. Cardholders can download the app in their mobile phone and operate from any place and get access to operational statistics- stock position, distribution patterns. The ration card holder can connect to this app by entering the card number and can findout the nearest ration shop, get direct access to activity of shop. 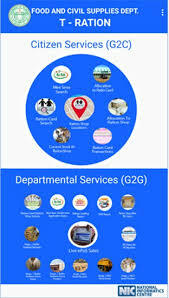 Applicants can know the status of stocks in go downs, loading and unloading details from the seven applications under G2C and 13 G2G services. This app will make things easier for ration card holders and main idea is to ensure transparency. T-Ration App can be downloaded free of cost from Google Playstore and also from ePDS website. From your android mobile phone go to Google Play Store or you can visit the official website epds.